These festive flavored cranberry orange meatballs are perfect on a holiday buffet or as a little nibble while waiting on the big meal to finish up. I hate to imagine life without a bag of frozen meatballs in my freezer. I have used them for last minute parties, potlucks, fellowships, and even entire family dinners when the need arose. Making them homemade is always great but having that bag of all beef meatballs (we also love the turkey ones) on hand for “food emergencies” has saved the day on more occasions than I care to count. 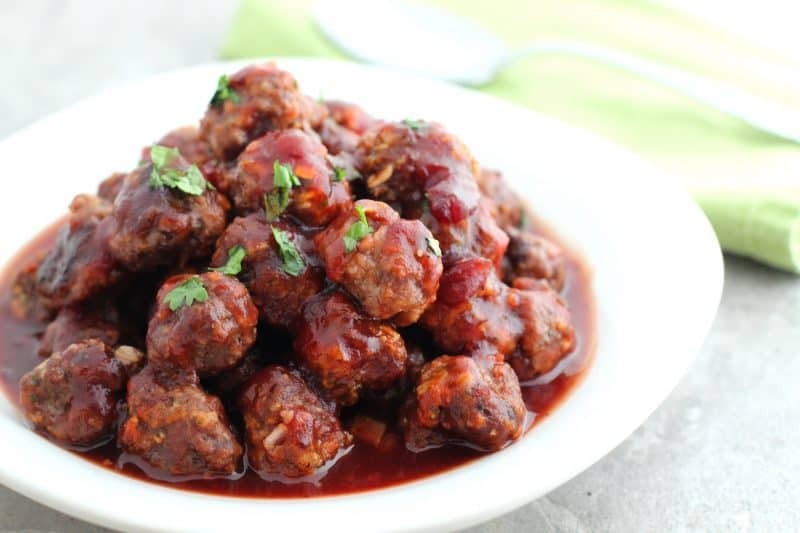 One of our favorite recipes for meatballs are my Dr Pepper Meatballs, but these sweet and mildly spicy cousins come in at a very close second and have a distinctive holiday flare to their taste. To make them, you’ll need: Fully cooked frozen meatballs, whole berry cranberry sauce, chili sauce, honey, orange juice, salt, and pepper. Place all ingredients except for meatballs into a large sauce pot or dutch oven. 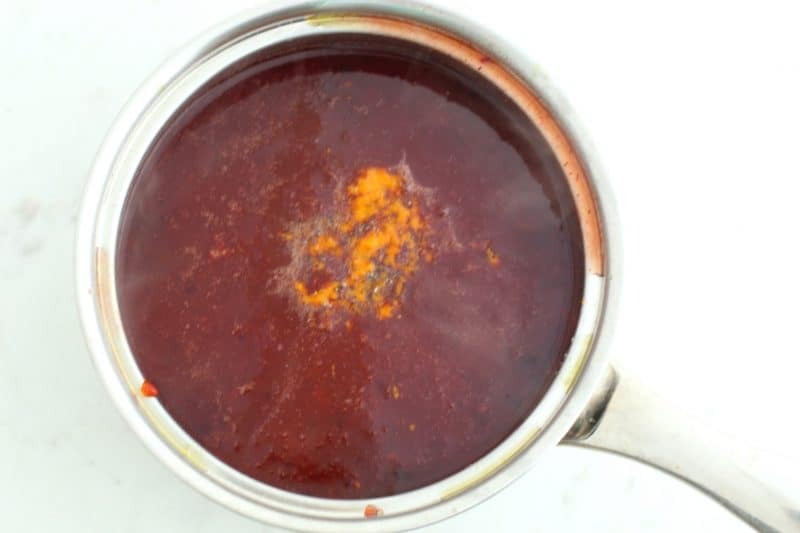 Bring just to a boil over medium high heat while stirring often. Carefully add meatballs and reduce heat to medium low. Simmer for 15-20 minutes, until they are heated through and sauce is thickened. I hope y’all are as excited as I am about the first day of November! The leaves are just now starting to change where I live and we have the prettiest rain today. We’ve been looking forward to Thanksgiving all year and I can’t believe we are finally in the home stretch! What are your Thanksgiving plans? Combine everything except meatballs in a dutch oven or similar pot on stovetop. Stirring constantly, bring just to a boil over medium high heat. Reduce heat to medium low. Carefully add meatballs and stir to coat. Continue cooking until meatballs are heated through and sauce is thickened, 15-20 minutes. Serve on their own as an appetizer or over rice as a meal. Hello Christy……thanks so much for the wonderful recipes you post on your blog! I have a whole folder of them and enjoy fixing them regularly. They are family friendly, for sure! This Cranberry Cocktail Meatball recipe will be perfect for our “snowbird” get togethers in Orange Beach, Alabama…..we head there for two months every winter to get out of the Iowa cold and snow!!! Again, thanks!!! 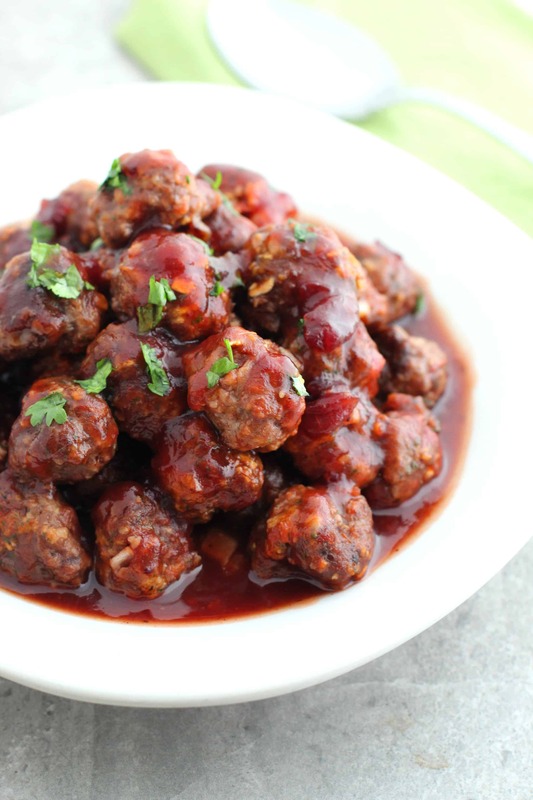 How will this recipe for Cranberry meatballs work in a crock pot? If so, give me a few hints to crock pot this recipe. Sure will! I would place all ingredients in there, stir up the sauce ingredients to break them up a bit, and then add the meatballs. You’ll want to stir from time to time and the sauce won’t thicken as much but it will still thicken some. Low, about 4-5 hours, high 2-3. Thank you Christy for this wonderful recipe for these Holiday Meat Balls. I am planning on making some this weekend for my husband and my self. Then am going to make another batch to carry to a friend’s home for a small get together. Can’t wait to make these.. I just made my Thanksgiving plans right now: make these meatballs soon. : ) They sound great! 🙂 I hope you love them as much as I do!! What brand of meatballs do you prefer? I like to get the all beef ones. Publix has some Angus beef ones that are amazing. I can’t recall the brand but they are in a red, green, and white package.